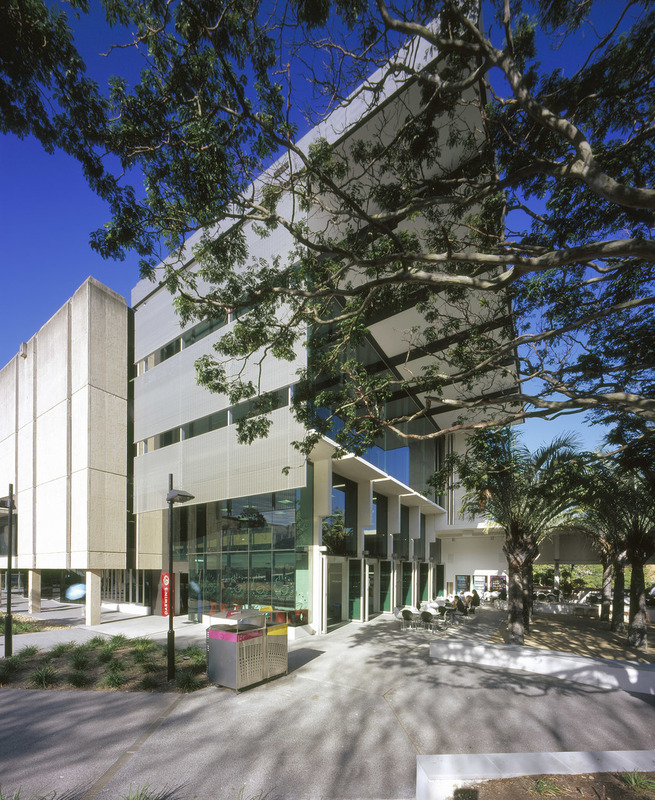 Wilson Architects were engaged to undertake an upgrade of the UQ Biological Sciences Library to provide additional floor space to accommodate increased student numbers and changes in the nature of service delivered by the library /'cybrary' and upgrade the building to comply with current building codes, including equitable disability access. The project also explores the potential links between the building and the adjacent Qld Biological Sciences Precinct. Strategies to extend, reinvigorate and bring to code need also attend to the confronting and unwelcoming material and form of the existing building. The refurbishment of the old Biological Sciences library representsa significant transformative physical, symbolic and pedagogical shift. Physically and Symbolically the building has gone from a fortress unwelcoming bunker into a building which engages with the whole university community. Pedagogically the building now responds to the change in student study behavior and supports collaborative approaches to learning. The Biological Sciences Library Building has been designed with various environmental principles in mind. Appropriate sun shading was carefully developed with the aid of computer modelling systems. High performance glazing was specified. The deep plan arrangement was adopted to maximise the temperature stability of the internal spaces, and the use of light sharing by use of extensive internal glazing ensures borrowed light penetrates through into the internal spaces. The newly introduced skylight above central stair void provides natural light into the deep part of the plan.